Ilyanassa obsoleta has a plain, dark black or brown shell, 1.5-3 cm high, with 5-6 whorls (a whorl is one complete turn of the spiral shell) and a blunt, conical spire. The shell's surface is decorated with a network of weak, beaded lines. 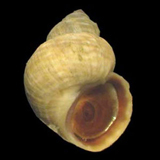 The aperture (the opening through which the snail emerges) is roughly oval and about half the height of the shell, with a notch at the bottom. The outer rim of the aperture is thin and sharp, and the inner side of the aperture has a spiral fold near its base. 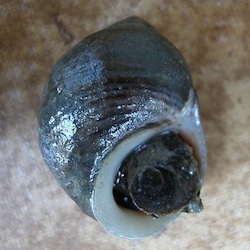 The inside surface of the shell is a deep, purplish black. The shell is often covered with mud and algae (and sometimes with the Atlantic bryozoan Alcyonidium polyoum), and in most older snails the tip of the shell is eroded. 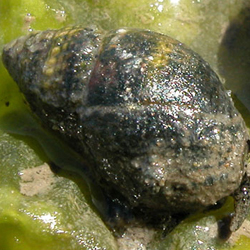 Ilyanassa obsoleta is the most abundant intertidal snail on San Francisco Bay mudflats and in the lower reaches of marsh channels, where it is often found in large herds. As this snail crawls over the mud surface it leaves a grooved trail behind, and when the tide goes out it usually burrows under the surface to avoid drying out. It has been collected in the bay in salinities of 10-32 ppt and water temperatures of 13-22° C. It feeds on diatoms and algal detritus that it gleans from the surface layers of the mud, captures and consumes minute worms (in the family Spionidae) that live in the mud, and scavenges on dead fish, crabs and other animal remains. 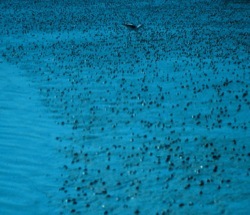 It is fed on in turn by ducks and the larger shorebirds. Ilyanassa obsoleta deposits its eggs in small, bristly, faceted capsules that are attached to hard surfaces. Each capsule is about 3 mm high and contains several eggs. The capsules are often laid in rows on eelgrass blades, or in rows or clusters on shells, stones or debris on the mudflats. The young snails emerge as free-swimming larvae. The larvae drift in the plankton for 20-30 days, feeding on phytoplankton, before settling to the bottom and metamorphosing into tiny snails. Ilyanassa obsoleta can live for up to 5 years. 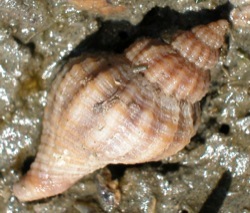 The San Francisco Bay mudflats where Ilyanassa obsoleta is now found were once occupied by the native hornsnail Cerithidea californica. 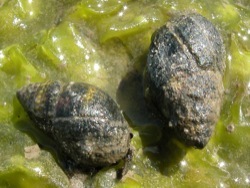 Race (1982) describes how each spring the two populations of these snails collide in the lower marsh channels. By mid-summer Ilyanassa obsoleta has restricted the native hornsail to the upper channels and shallow pools in the upper marsh through a combination of egg predation and direct competitive interference. The high marsh pools (also called salt pannes) are too salty for Ilyanassa obsoleta, and thus provide a habitat refuge for the native snail. Several species of trematode flatworms parasitize Ilyanassa obsoleta. One of these, the avian schistosome Austrobilharzia variglandis, apparently reached the West Coast with Ilyanassa and caused outbreaks of "swimmers' itch" in San Francisco Bay in the 1954 and near Vancouver in 2001. 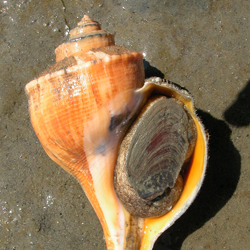 Ilyanassa obsoleta has been reported from but is apparently not established in Birch Bay in northern Puget Sound [collected in the early 1950s], and in Humboldt Bay [collected in 1932], Bodega Harbor [collected in 1968], Tomales Bay [collected in the 1920s-1930s] and Bolinas Lagoon [collected in the 1920s or earlier] in California. In San Francisco Bay, Ilyanassa obsoleta has been collected from the upper end of the Carquinez Strait and Mare Island Strait in the north to the southernmost end of the bay, where it can be extremely abundant. It has been collected at Angel Island, but not from sites closer to the mouth of the bay. Ilyanassa obsoleta most likely reached the Pacific Coast with shipments of Atlantic oysters (Crassostrea virginica), traveling either as snails or as eggs that had been laid on the oysters. It has been collected in oyster beds on the Atlantic Coast, and shipments of these oysters to San Francisco Bay started in 1869 and peaked in the 1890s. 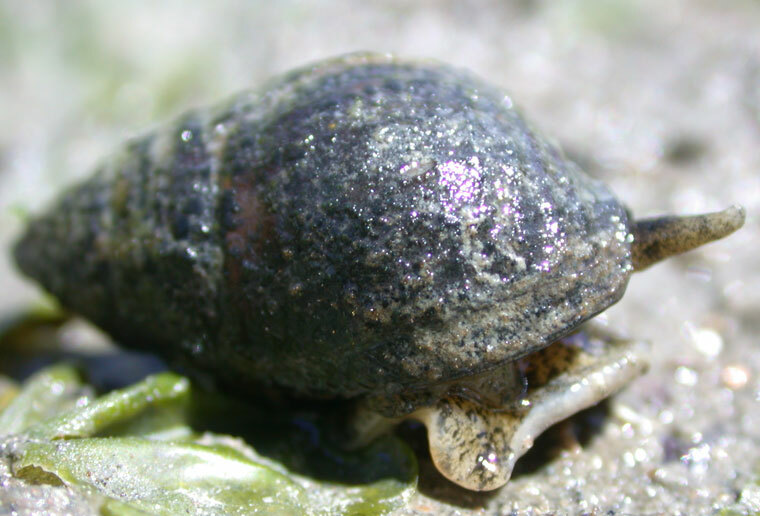 Ilyanassa obsoleta's first record on the Pacific Coast is in 1907, on beds of Atlantic oysters in San Francisco Bay. Oysters were also shipped from the Atlantic Coast to Willapa Bay and Boundary Bay in the late 19th and early 20th centuries, and later from San Francisco Bay to Willapa Bay, and those shipments could have introduced Ilyanassa obsoleta snails or eggs into the two northern bays. Carlton, J.T. 1979. History, Biogeography, and Ecology of the Introduced Marine and Estuarine Invertebrates of the Pacific Coast of North America. Ph.D. thesis, University of California, Davis, CA (pp. 404-412). Cohen, A.N. and J.T. Carlton. 1995. 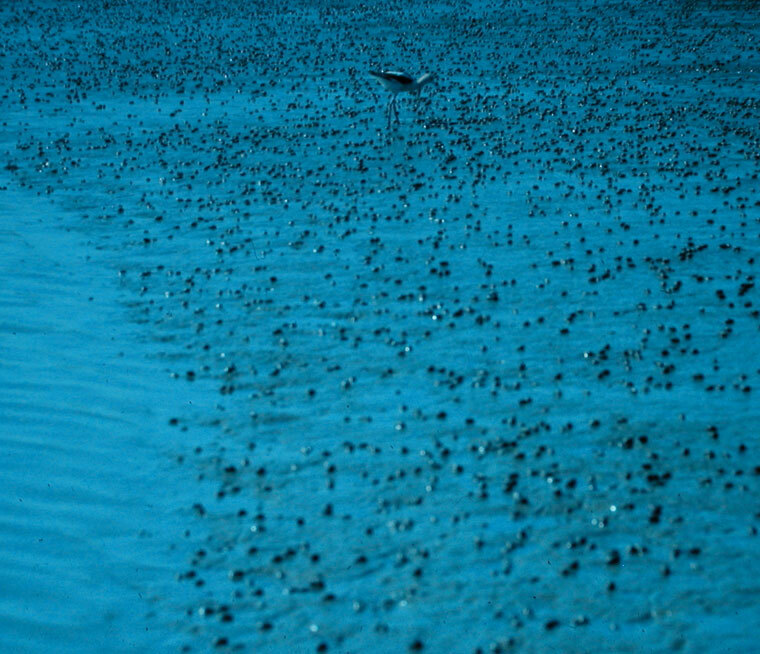 Nonindigenous Aquatic Species in a United States Estuary: A Case Study of the Biological Invasions of the San Francisco Bay and Delta. U.S. Fish and Wildlife Service, Washington, DC (pp. 52-53). Morris, R.H., D.P. Abbott and E.C. Haderlie. 1980. Intertidal Invertebrates of California. Stanford University Press, Stanford, CA (p. 289). Race, M.S. 1982. Competitive displacement and predation between introduced and native mud snails. Oecologia 54: 337-347. Ilyanassa obsoleta on a green seaweed (Ulva lactuca), on a mudflat in San Francisco Bay. 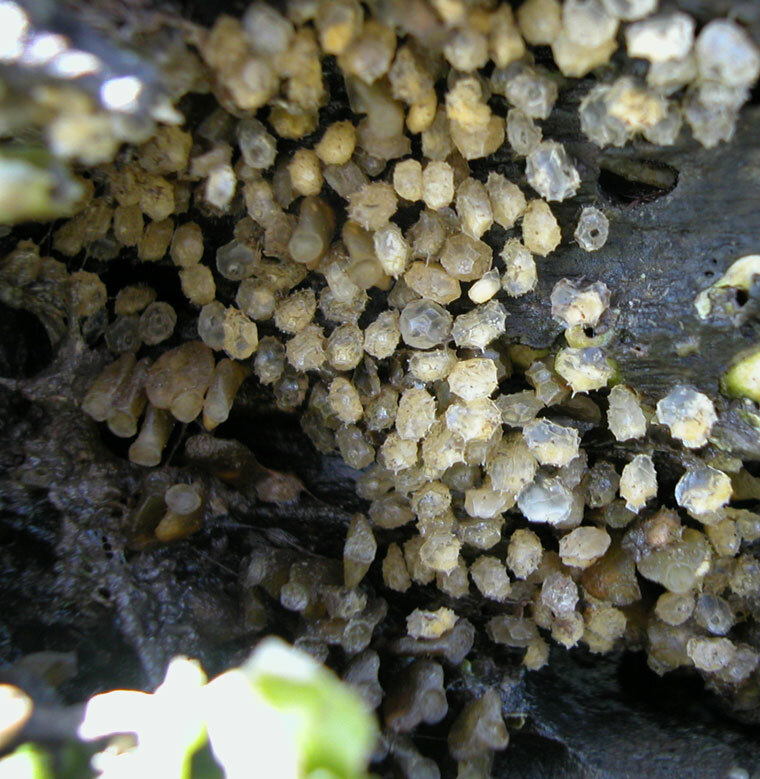 llyanassa obsoleta in San Francisco Bay. 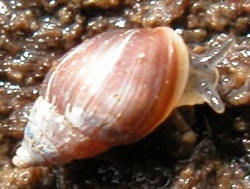 Ilyanassa obsoleta on a New England mudflat. 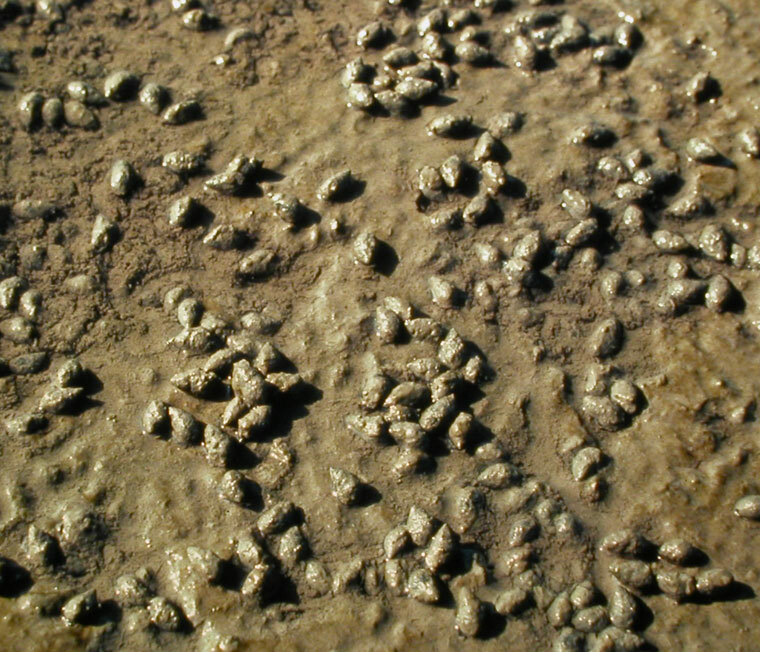 Ilyanassa obsoleta on a mudflat in south San Francisco Bay. 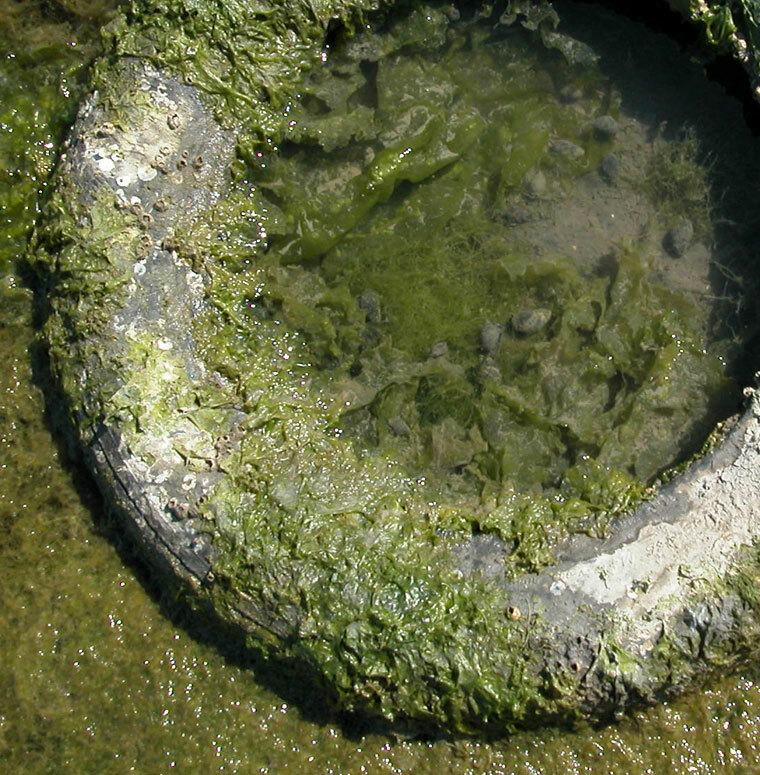 Ilyanassa obsoleta in a tide pool in a discarded tire, grazing among the green seaweeds Ulva lactuca and Enteromorpha intestinalis, in San Francisco Bay. 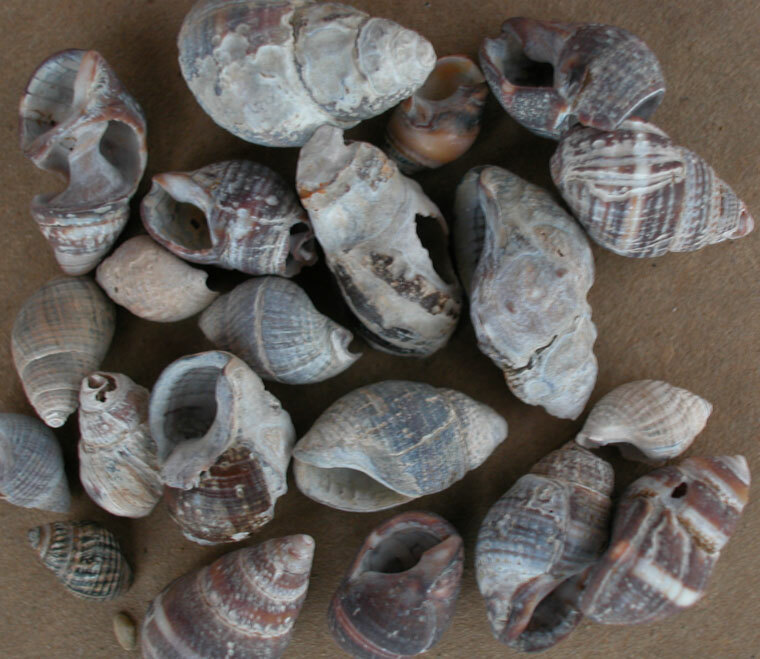 Ilyanassa obsoleta shells that had washed up on the shore in San Francisco Bay. 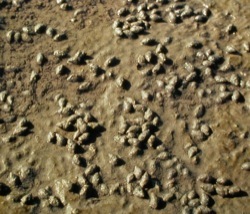 Ilyanassa obsoleta egg capsules on a log lying on a mudflat in San Francisco Bay. 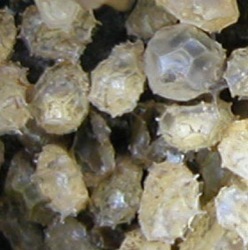 At the left and bottom of the image are the larger, smoother, urn-shaped egg capsules of the snail Urosalpinx cinerea. Close up of Ilyanassa egg cases from the previous image. 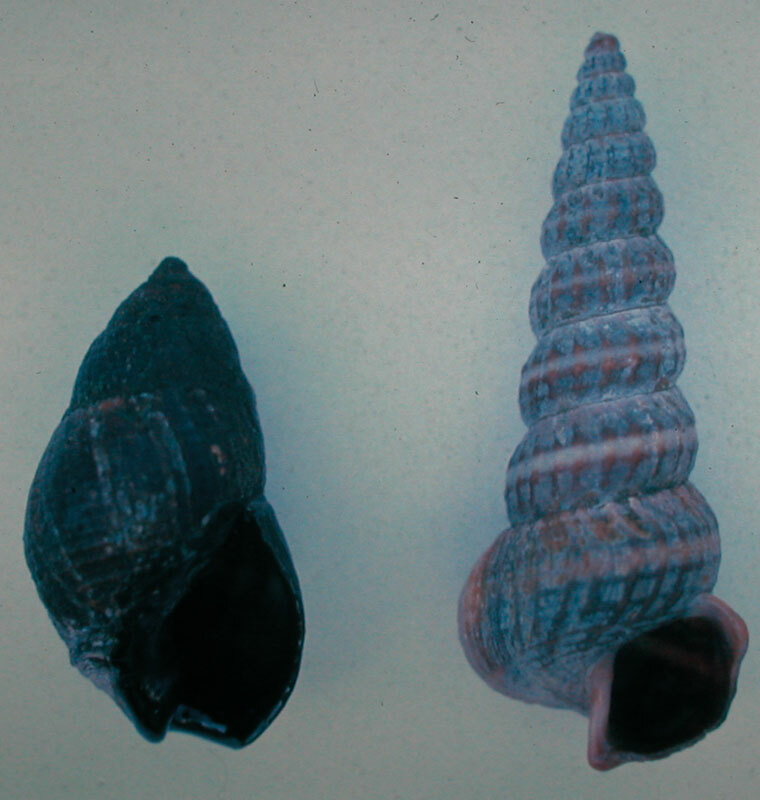 Ilyanassa obsoleta on the left, with the native hornsnail Cerithidea californica on the right. Shells from San Francisco Bay.